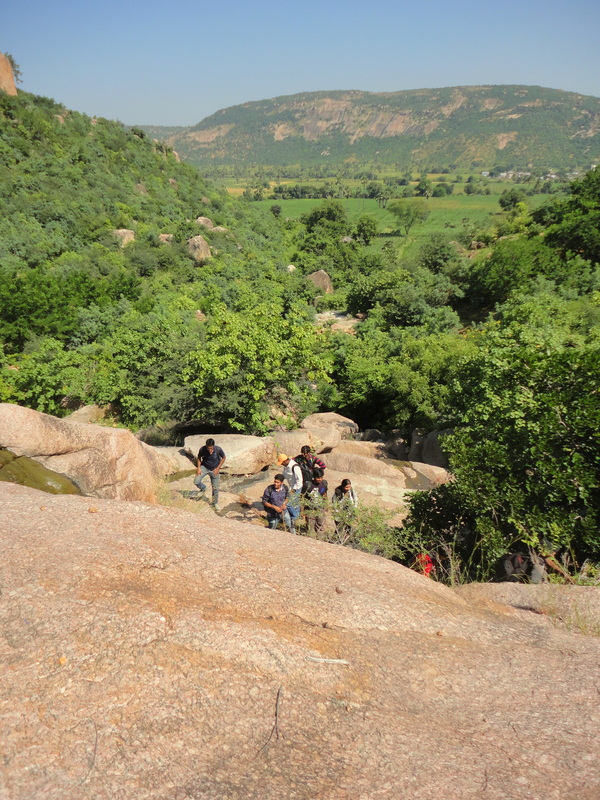 It was weekend and I had a rough week at work and desperately wanted a break … Hyderabad trekking club was hosting a trip to Bodakonda hills and I jumped right in. It was a one day trip. We started at 6am from hyderabad in cars and bikes. 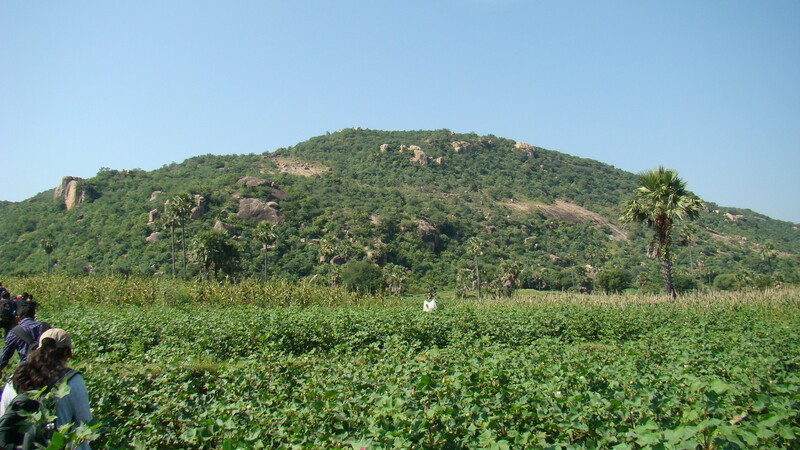 Bodakonda was a village in Ranga Reddy district, 75 kms from Hyderabad surrounded by beautiful hills and forest. We reached the village in a couple of hours, passing small villages, thandas on the way. We parked our cars and bikes, did a small introduction round among our group of 23, laid down some basic rules like no littering, walking in one line, distance between each person, code calls if we get lost …etc and started off towards the hills. The route was to pass through the fields, reach the bottom of the hills and the start climbing through the forest till we reach the top most part. It looked like an easy trek. Once we crossed the fields, we reached the bottom of the hills where the forest begins. We started the ascend. 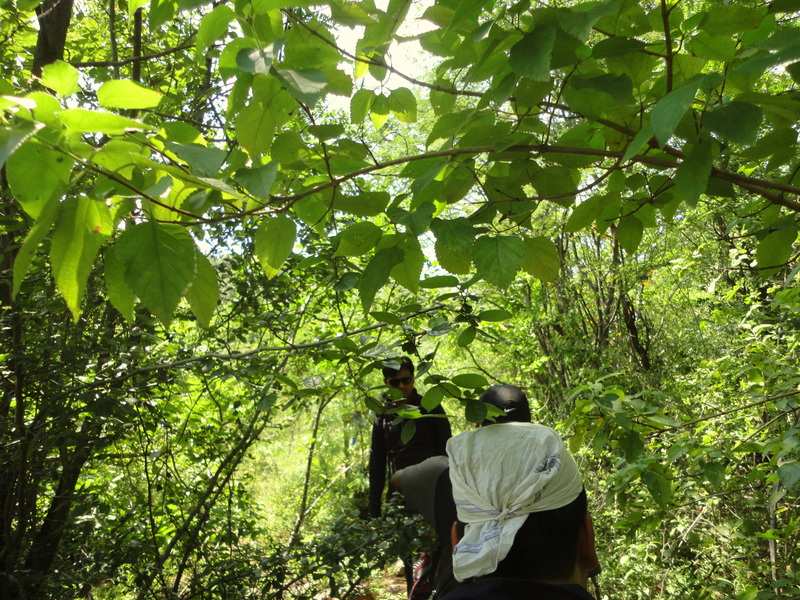 It was not very steep, but the trees were dense at some places, that you have to carefully make your way through them and avoid getting scratched. Climbed some rocks, passed a small stream, ate some wild berries, walked through muddy slushy waters( thankfully no leaches and snakes, phew! ) , jumped ditches( of course comes without saying fell some more times) …..
Around 2pm we managed to reach the top of the hills…it was all rocky and hot. Found a small cave where everyone managed to squeeze in to break for lunch and rest for sometime. 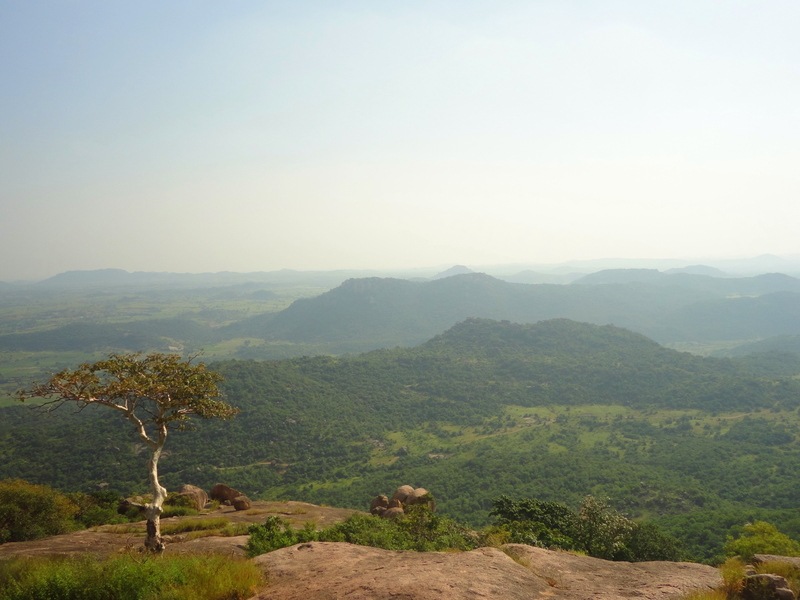 It was a nice scenic view from the top , would have been amazingly great in the monsoon time. We later started our descend which was much quicker. Rajinikanth style of walking always works when you are climbing down the hills, walking side ways, basha style 😉 . 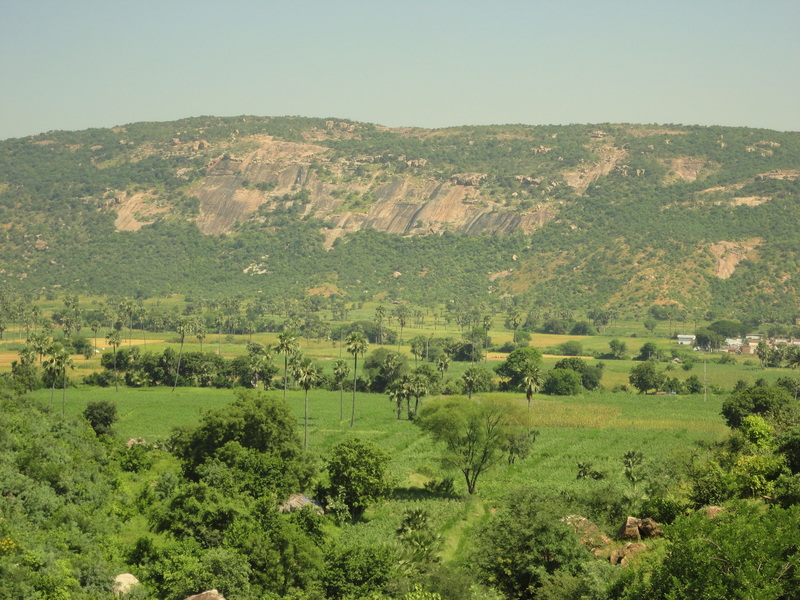 Reached the village where the villagers pooled up to look at us very curiously……at least we provided some amusement to them ;)……somehow they found it very funny that we came all the way to climb the hills…freshend up, said goodbyes and started back to Hyderabad.. 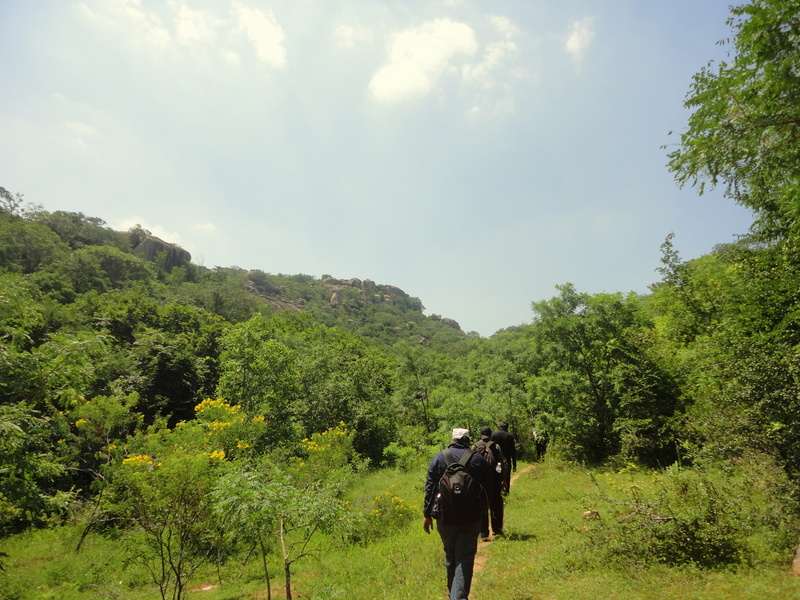 It was a nice trek…was not very difficult, but was a long one, the day was hot and the forest was thick, which made it quite exhaustive which was what I needed…a nice one for a quick one day getaway. 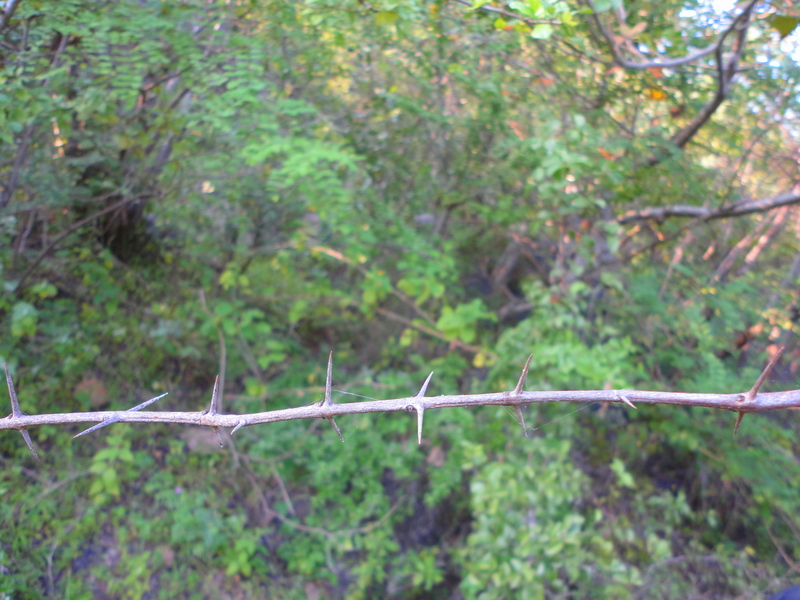 But on a more serious note, it is just the perfect summary of the trek. Nice work.